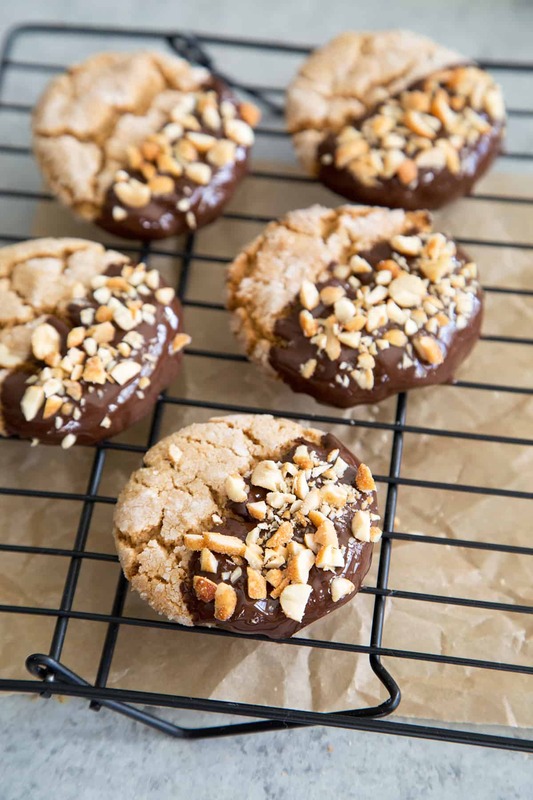 Chocolate Dipped Peanut Butter Crinkle Cookies: a sweet, salty, and chocolatey cookie that’ll satisfy any peanut butter fan. I’m writing this post on a cold evening while wrapped in a warm fuzzy blanket flanked by my two pups with the NSYNC holiday album playing in the background. The countdown to Christmas is on and my belly is well aware of this sugary season. Within the past three days, I’ve consumed more cookies than I usually do in a month. (That’s a lot!) No complaints, though. I love this time of year. I love testing about a dozen or so cookie recipes until I find the perfect ones to share with friends and family. These chocolate dipped peanut butter crinkle cookies are definitely a contender (if not the winner) of my annual holiday assorted cookie boxes. It’s a simple and straightforward peanut butter cookie that is both soft and chewy, yet sturdy and crisp. The cookie recipe is adapted from one of my favorite magazines, which I “take” from my in-laws’ house monthly. The cookies remain soft days after baking, making them perfect for gift giving. I used this 1.5 tablespoon cookie scooper (#40 scoop) to portion out the dough. 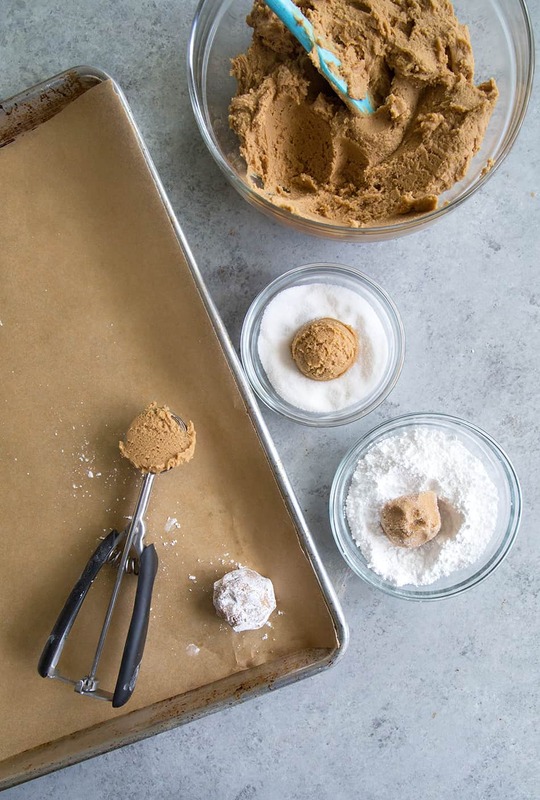 The balls of peanut butter cookie dough are rolled in granulated sugar and then coated with powdered sugar before baking. 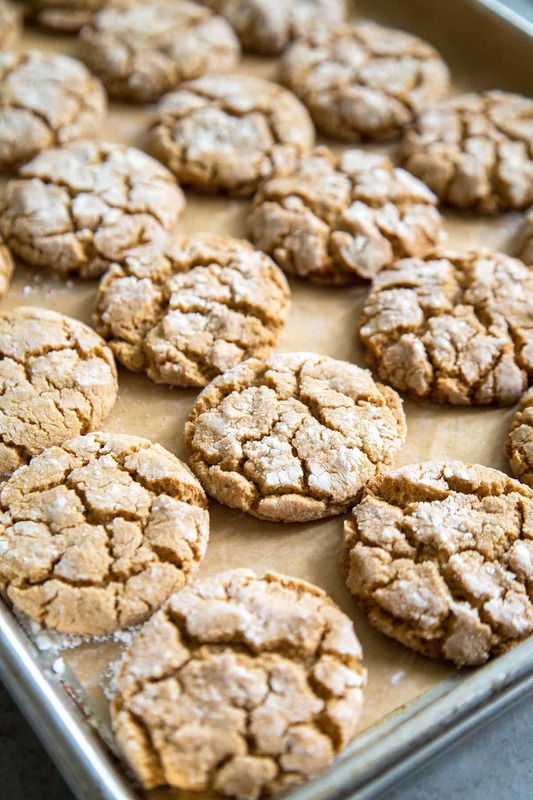 And magically, you end up with these beautiful crinkle/earthquake cookies. While they should be finished and ready for consumption at this point, let’s take it a step further. 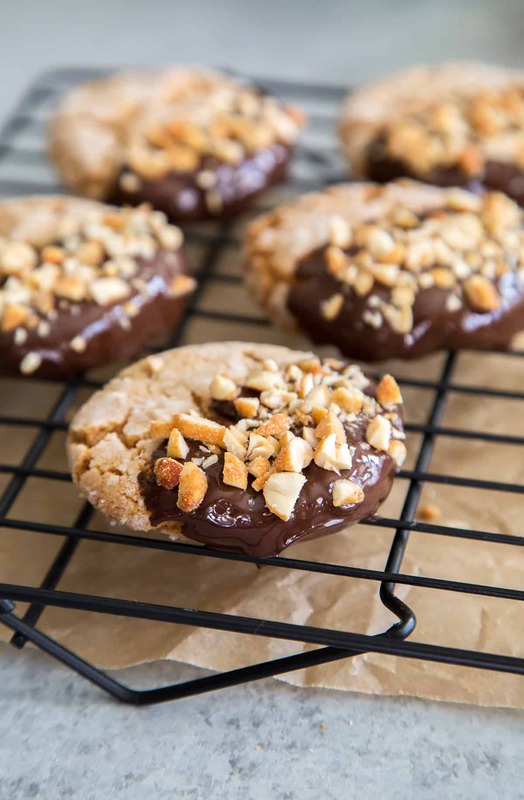 Generously sprinkle chopped honey roasted peanuts over the chocolate dipped peanut butter crinkle cookie and- voila! my new favorite Christmas cookie! In the bowl of stand mixer fitted with a paddle attachment (or using a hand mixer), cream butter until smooth. Add brown sugar and peanut butter. Beat until mixture is creamy. Add egg and vanilla and mix until combined. Scrape down bowl as needed to ensure thorough mixing. Add flour mixture and mix on low speed until there are no longer any dry streaks of flour. Using a 1.5 tablespoon cookie scoop, portion out the peanut butter dough. Roll dough in granulated sugar. Then rolled dough in powdered sugar until coated. 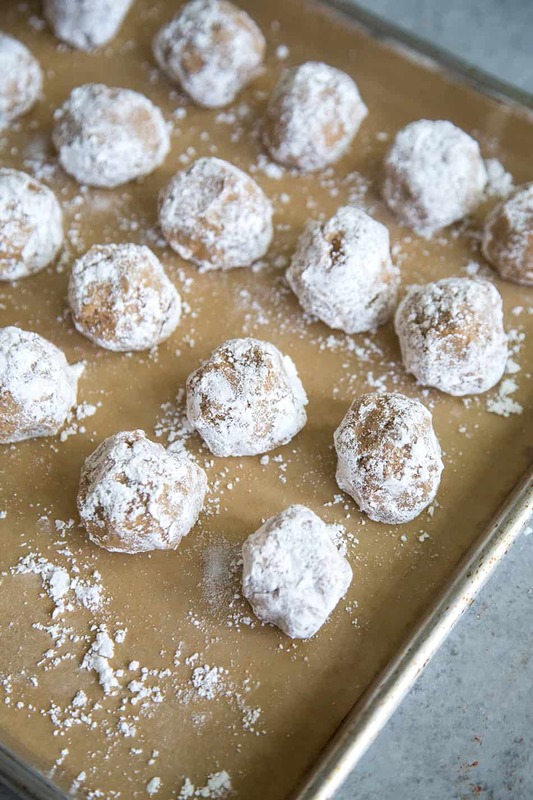 Place cookie balls at least 2-inches apart on a parchment lined baking sheet. Bake cookies for 15-18 minutes until the edges of the cookies are set and the cookies are cracked on top. 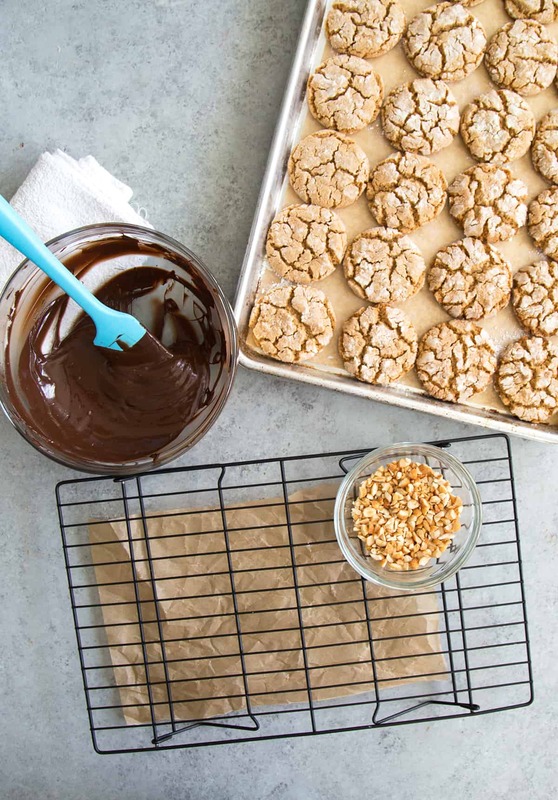 Allow cookies to cool in pan for 3-5 minutes before transferring to a wire rack to cool to room temperature. Gently melt chopped chocolate over a double boiler. Stir until smooth. Remove from heat and allow to cool slightly. Dip room temperature cookies in melted chocolate. Set on a wire rack and sprinkle chopped peanuts over cookie. Allow chocolate to set up at room temperature before eating. *If chocolate is overheated and out of temper, you can set up the chocolate dipped cookies by letting them cool in the fridge for 5 minutes. Do not leave the cookies in the fridge for too long. Man your cookies look awesome. Wish you;d submit your recipe to some of the cookie dough manufacturers. All KINDS of goodness going on in this cookie! These are a perfect crowd-pleaser for a cookie party! Thanks for sharing! These dipped cookies look absolutely amazing! Those look perfect, I love the crushed peanuts over the chocolate! Oh my goodnesas, these cookies look amazing!! YUM!! I will never say no to a crinkle cookie! I will surely have a hard time putting these cookies down. They look SO good!